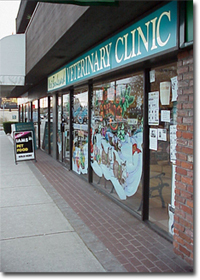 West Boulevard Veterinary Clinic is a purpose designed facility located in Kerrisdale Square. 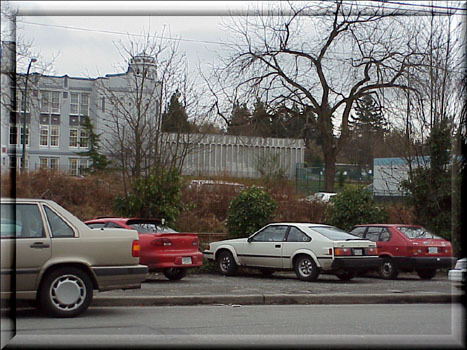 The following is a pictorial guide from the street entrance to the back door. 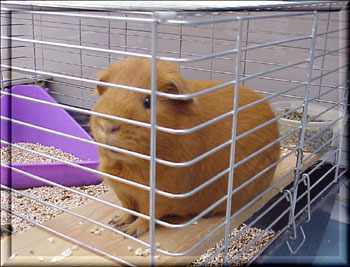 Most inhabitants are very elusive, but if you look carefully you may get a glimpse of one. 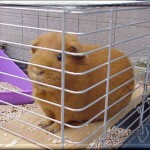 Dr. Potter remains hidden behind the camera lens! 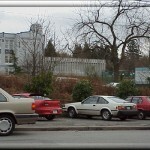 PARKING…There is ample curbside parking, a lot directly across the street and limited underground parking space. 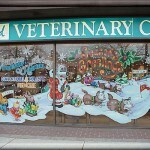 THE FRONT WINDOW is custom painted to reflect the season. 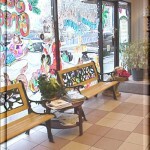 RECEPTION…is the hub of the front/public area of the clinic. The sign below the etching was given to us by a client. It reads “Unattended Children Sold as Slaves”! 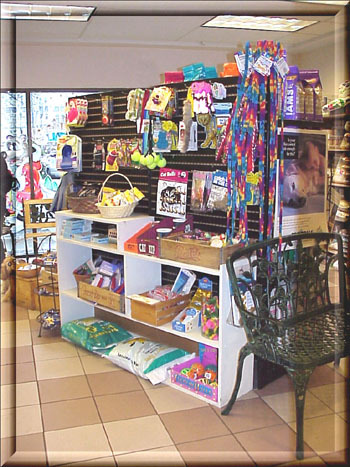 RETAIL ITEMS are limited and reflect diets and pet supplies that are often recommended by the doctors and staff of the hospital. 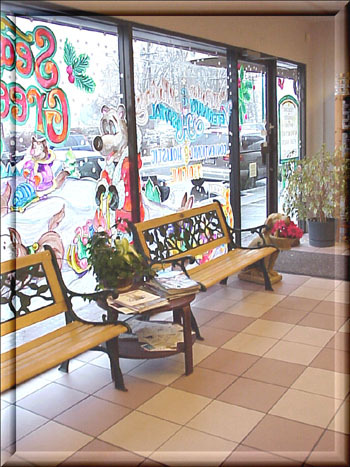 SEATING AREAS… are located within the reception/retail area. 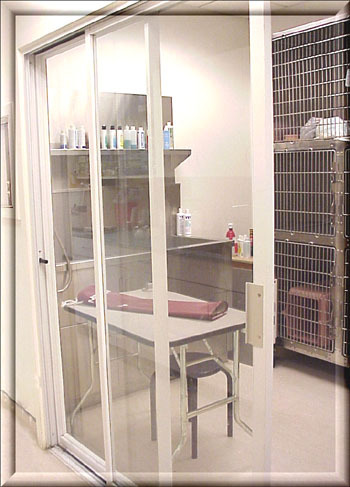 EXAMINATION/CONSULTATION ROOMS…are equipped to accommodate different sized animals. 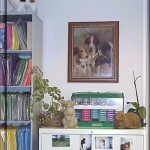 The “Dog Room” has a hydraulic table allowing for effortless adjusting of table height. 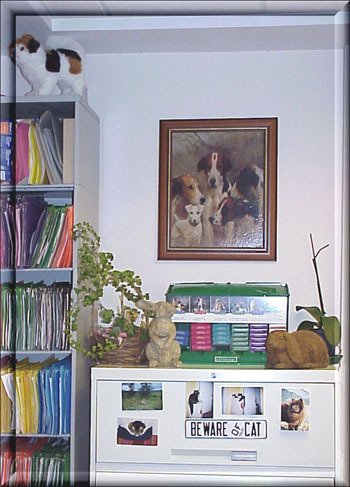 The “Cat Room” has a small fold up table. 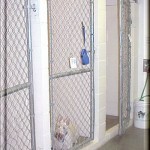 When retracted against the wall this becomes a table free room for large breeds, gait analysis etc. 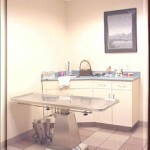 TREATMENT… is the heart and soul of the clinic. 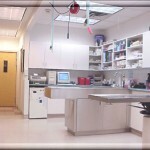 Looking from the exam rooms towards the lab equipment and cat ward. 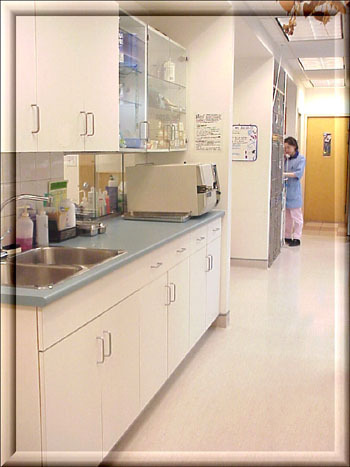 Treatment tables (dry and wet) and pharmacy. 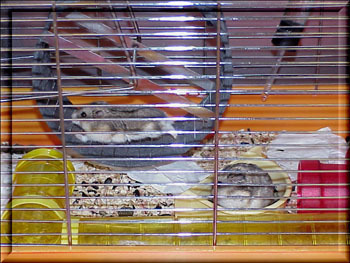 Post op ward is on the left. 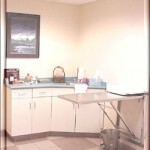 The wet table is where dentistry and non sterile procedures are performed. 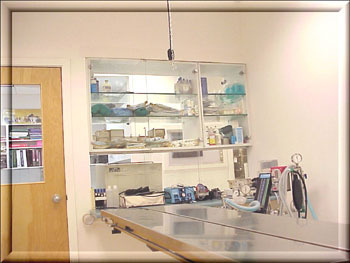 Surgical prep (scrub) …sliding glass panels and pass through glass doors connect scrub to surgery. 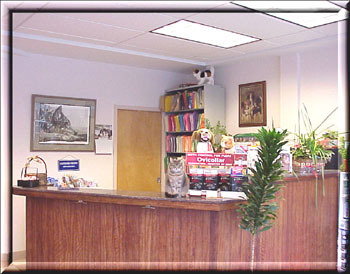 Dr.Kutney is at the records/phone station adjacent to the post op ward. 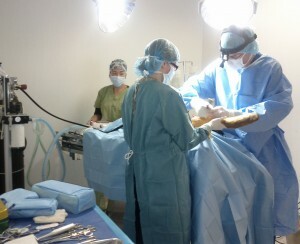 SURGERY … is adjacent to treatment and surgical scrub. 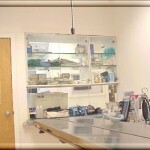 Surgery and treatment house most of the clinics’ more specialized equipment. 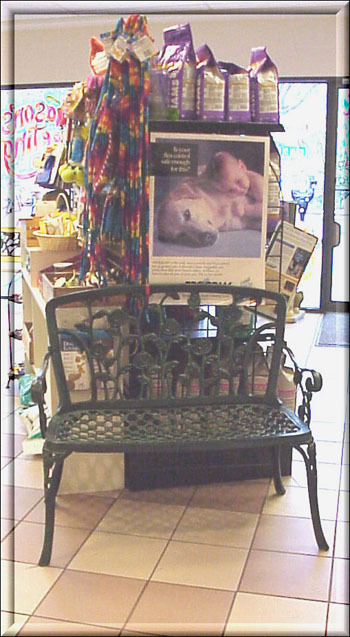 A hydraulic “V” trough table aids in patient positioning. Surgical lights, mounted from the ceiling and mobile floor models, keep the surgical field well illuminated. 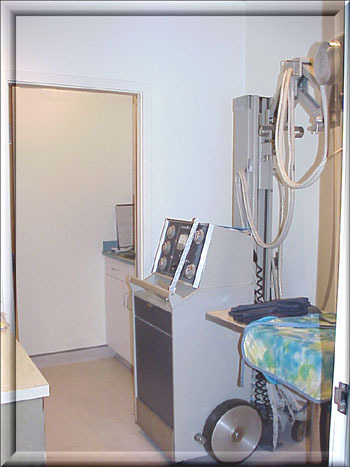 The anaesthetic equipment is portable and can be located anywhere in-line oxygen is available. 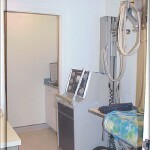 Oxygen is piped to various stations throughout the clinic. Parallel to this system is that for the anaesthetic exhaust. Patient monitoring/safety devices…Electocardiogram, Capnograph, Oxygen monitor, Blood Pressure Doppler for heart rate and blood pressure, Hot Dog patient warming system etc … can be moved from room to room. 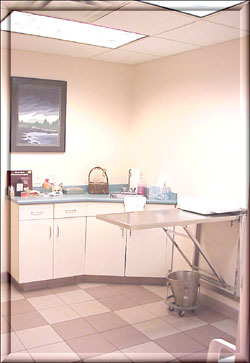 Surgery has separate ventilation to keep the room as aseptic as possible. 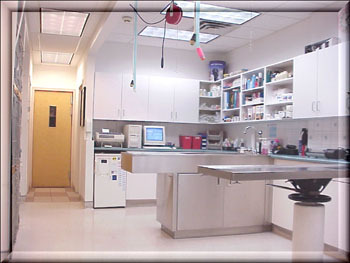 The autoclave, for sterilizing instruments and surgical scrubs, is located adjacent to surgery. 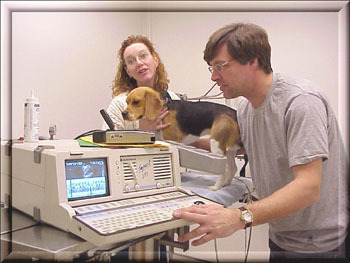 Ultrasonography is usually performed in the “dog” examination room. 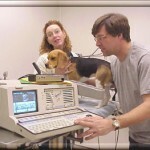 Board Certified Radiologists bring both their expertise and equipment to our facility. View past scrub looking towards the cat ward. 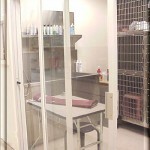 Hydro ward on left (behind sliding glass doors) and X-Ray on right. Radiology at WBVC is now digital so film viewers are used only for viewing older films or films that come with new patients for review. 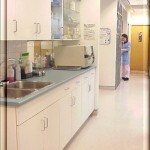 HYDROTHERAPY WARD… Looking through the glass doors. 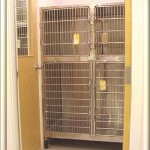 This room contains a custom designed stainless tub for hydrotherapy and medicated baths. 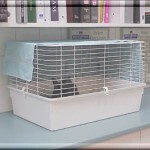 Many cats prefer staying in this ward as it is visually open but quiet. 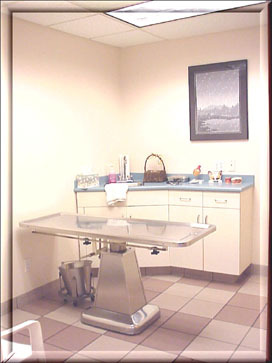 RADIOLOGY (X-RAY) is a separate room. 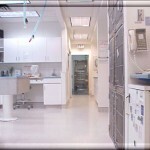 The dark room is now used to archive older film radiographs. 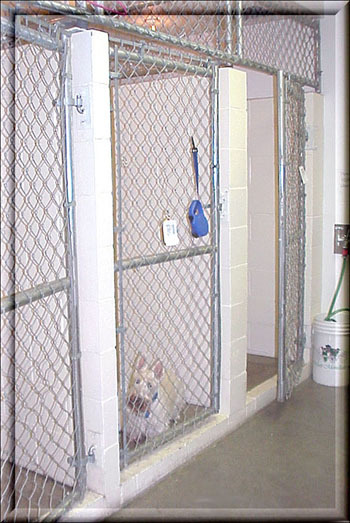 ISOLATION… is for contagious cases and has a separate ventilation system. 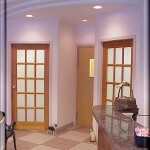 Glass inserts in the doors allow for easy viewing of the patients. 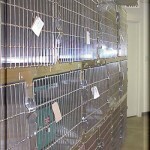 THE RUN WARD… has solid walls and each run is screened from floor to ceiling. 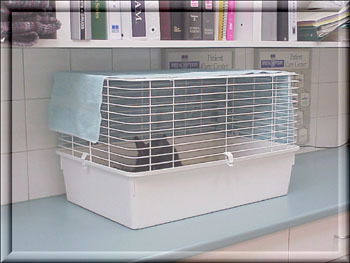 Individual drains in each run, with no connecting gutter, aid in cleaning and disinfecting. As in all the wards, there is separate lighting on dimmer switches in addition to the fluorescent lighting. 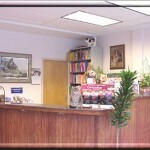 This enables us to set the most favorable level of lighting for the patients’ comfort. 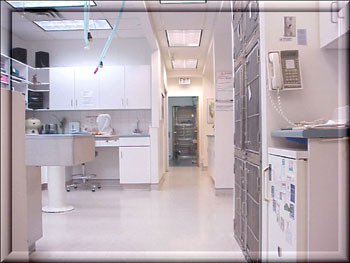 Along with the soft lighting, quiet music is played throughout the wards. 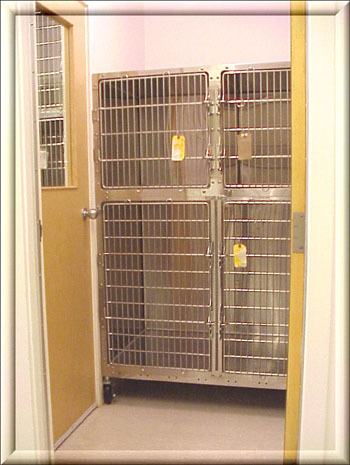 THE CAT WARD… is at the back of clinic. 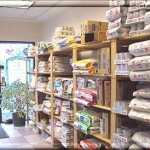 This area also houses the pet food preparation area and the laundry. Thus, although at the back (where it is quiet), the cats have lots of human company. 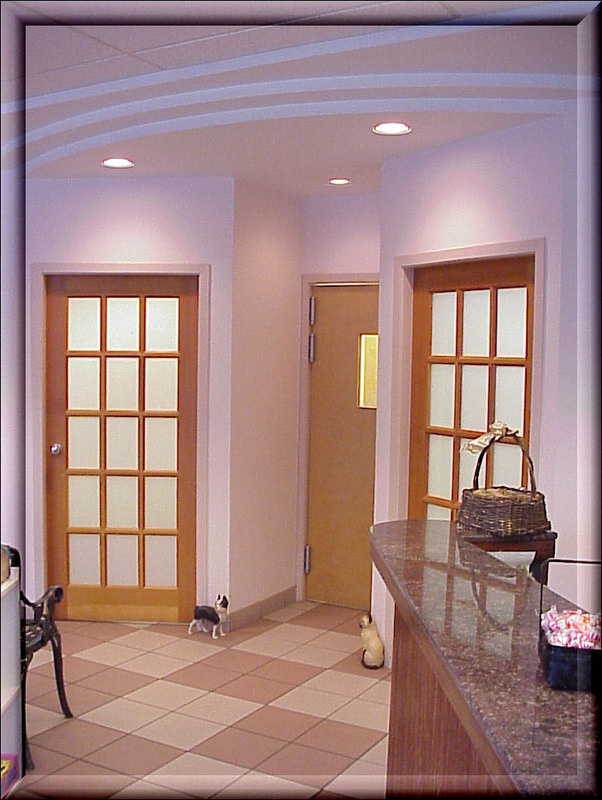 To keep noise to a minimum all clinic doors have solid wood cores and the ceilings are constructed of acoustic panels. 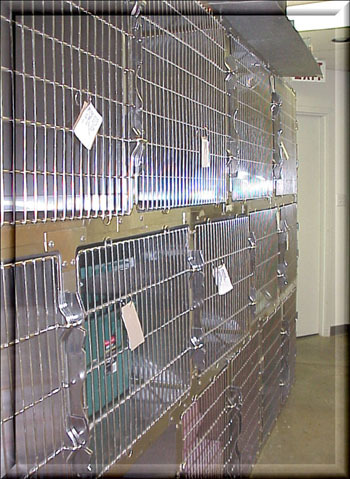 BUNNY ROW… as we fondly call it, is an area in treatment where small cage pets are housed. 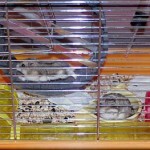 Sheltered under the overhanging cupboards, it is where they seem most content. 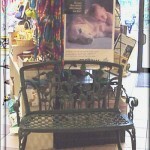 In some areas you may notice some of the equipment used in the day to day care of our patients. 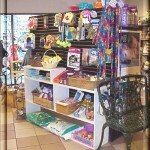 WBVC also maintains a well stocked medical pharmacy. 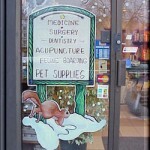 The pharmacy serves the needs of hospitalized pets as well as out-patients. 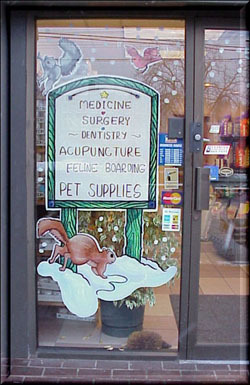 On site medications allow for immediate treatment which is an advantage for your pet and a convenience for you. As providers of health care we take nutrition seriously. 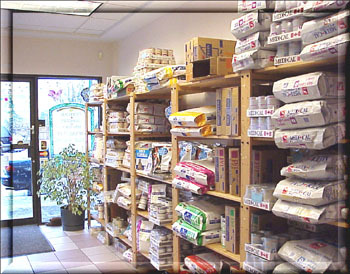 For your pet’s health, and your convenience, WBVC keeps a wide selection of veterinary exclusive diets in stock. 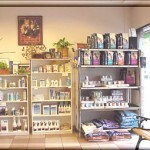 WBVC has life stage diets and diets for a variety of specific medical needs and illnesses. These diets are backed by sound nutritional research. 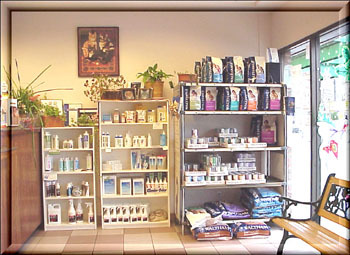 In addition each company has Boarded Veterinary Nutritionalists on staff to help us determine which diet is best for your pet. 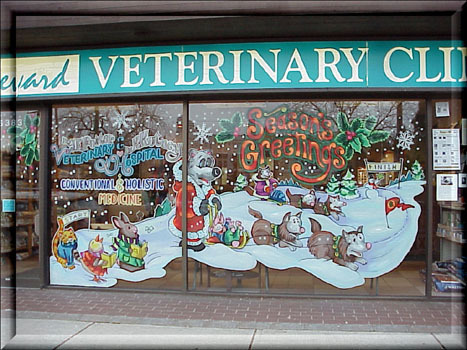 Our well appointed hospital, excellent team, stocked pharmacy and nutrition centre enable us to provide optimum care for your pet.